Reading aloud to kids is one of life’s great pleasures. It’s a chance to dust off your best character voices and share opinions, reactions and the sheer enjoyment of following a story together. Here are our favourite read-alouds for wee babies to bigger kids, from newer books to tried-and-tested classics. This deceptively simple book is enormous fun to read out loud. A mopoke is a small and cute Southern Boobook owl, and it appears on every page of this book in increasingly hilarious variations that use wordplay and sight gags. Babies will adore the repetition of ‘This is a..’ followed by lowpokes, and poshpokes, and yo!pokes and snowpokes and many more. Mopoke is great for introducing and playing with different sounds. When Mama and Baby go to the bustling market to shop, Baby secretly receives gifts of fruit and biscuits and other treats from every vendor they pass. Clever Baby eats some treats, then puts the rest in the the basket on Mama’s head. As the shopping trip wears on, Mama starts to worry about how hungry Baby must be getting… Visiting each market stall gives this playful story a satisfying rhythm, the illustrations are bright and appealing, and there’s the added bonus that numbers are introduced in a gentle way. George really wants to be a ‘good dog’ when his owner Harry leaves him at home alone, but it turns out the house is full of temptations: a cake on the bench, the cat to play with, dirt-filled pot plants… Haughton’s bold retro illustrations bring long-eared George to life, and the straightforward text has some delightful refrains – ‘What will George do?’, ‘Oh no, George!’. George’s grappling with (and occasional triumph over) poor impulse control makes for a funny and relatable read aloud. When Harriet starts to plan her dress-up birthday party, her parents warn her not to get too carried away. Costume-loving Harriet dons her penguin costume and goes to the store to buy party hats – only to find herself swept up and literally carried away to Antarctica by a swarm of real penguins! Vivid pictures, perfectly-pitched text, and Harriet’s creative attempts to get back home in time for her party make this an extremely engaging story. Kids will love the blend of whimsy and reality and may want to discuss how much of Harriet’s adventure is real and how much is imagined. For ages 3 and up. Rollicking rhymes are at the heart of this story, making it perfect if you’re in the mood for an energetic and bouncy read aloud (it’s entirely possible this could turn into a boisterous group read). It turns out getting to the volcano for Dwayne-o and Jane-o requires train-o’s, crane-o’s, plane-o’s, going to Spain-o and other silly rhymes. The bright and busy cartoons mirror the anarchy and unpredictability of the story, making this pure pleasure to share with little people. For ages 3 and up. One hungry and very clever crow drives the action in this witty, bilingual tale, which includes English and Djambarrpuyŋu – a Yolŋu language from North East Arnhem Land – and vibrant artwork by renowned illustrator Bronwyn Bancroft. When Crow successfully steals a turtle egg, holding onto it turns out to be the difficult part. The egg gets passed on from animal to animal and person to person, with Crow in pursuit. The sequential journey of the egg through several different locations and environments is very satisfying, and the striking imagery adds further interest. A glossary, orthography and side-by-side English and Djambarrpuyŋu text allow readers to have a go at reading in both languages. For ages 3 and up. This is a funny, charming tale about an unlikely friendship between gentle Bear and grumpy Rabbit. When Bear goes looking for his missing stash of hibernation food, he encounters crotchety Rabbit, setting into course a strange series of events that involves poop, the peculiarities of rabbit digestion, a wolf and a snowman. This funny and sweet story is a balanced mix of full-page colour illustration and short plain sentences, with witty odd-couple dialogue that is a dream to read out loud. For ages 5 and up. 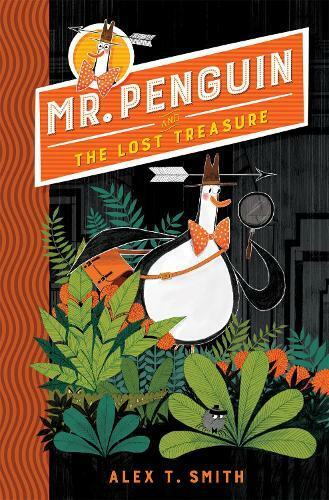 Good old-fashioned adventure is on the menu when Mr Penguin of Cityville and his top-hat-wearing, kung-fu-kicking spider sidekick Colin are hired by Miss Boudicca Bones to search for hidden treasure within the Museum of Extraordinary Objects. Their search heads into Indiana Jones-type territory when a mysterious tunnel leads into an even more mysterious jungle. This is a warm and witty adventure with short chapters, interesting vocabulary, a fast pace and snazzy black-and-orange illustrations – one that kids and adults can both delight in. For ages 6 and up. Polly the witch has trouble at school because the letters in her spell book jump around. Her best friend Buster the monster is embarrassed by his unusual problem of growing and shrinking with emotion. Polly and Buster live in a world where witches and monsters don’t mix, so in public they pretend they’re not friends. When Buster forgets this rule, and Polly casts a protective spell that is misconstrued as an anti-monster statement, Polly must decide between popularity and her true friend. Strong central characters, the themes of friendship, empathy and bullying, and digestible chapters with illustrations make this a natural choice to read out loud and discuss. For ages 6 and up. Effie Truelove attends Tusitala School for the Gifted, Troubled and Strange, but as in many great fantasy stories, the strangest and most troubling things happen to her outside of school. When Effie’s beloved grandfather, Griffin Truelove, is fatally attacked, Effie is deprived of a proper magical education and in control of several magical objects and an extensive magical library sought after by the evil power-hungry Diberi. Effie enlists the help of a ragtag bunch of schoolmates (and eventual friends) Max, Wolf, Lexy and Raven and together they embark on a dangerous and unpredictable mission. This is quirky, funny and enchanting fantasy with a group of very lovable young kids battling dark forces. For ages 9 and up. Fred, Con, Lila and Max are stranded in the Amazon rainforest when their light plane crashes. This group of four plucky kids have to overcome their differences and assumptions about each other to cobble together food, water and shelter. While their circumstances are dire, there’s also the wonders of the Amazon to discover, the excitement of the unfamiliar, a pet sloth to care for, and mysterious signs that they aren’t alone in the jungle… The Explorer has a wonderful classic age-of-exploring feel to it, and Rundell demonstrates her canny and sympathetic eye for the interior lives of its young protagonists. For ages 8 and up. One of the six shortlisted titles for The Readings Children’s Book Prize 2019 (all of which, I might add, would make great read-aloud books), The Orchard Underground is a sweet, wacky and very funny tale of two new friends, Pri and Attica, pursuing the many mysteries of the small town of Dunn’s Orchard. Themes of family, mental illness and environmental degradation weave around a fast-moving and increasingly weird set of discoveries and capers, and the witty dialogue and banter is made for acting out. For ages 8 and up.